Agricultural research capacity is an important factor in building food security and economic stability in Africa. Furthermore, new and better-targeted technologies are essential to this process, and a well-developed and wellsupported agricultural research system is a prerequisite not only for the design of these technologies but also for their dissemination and adoption. 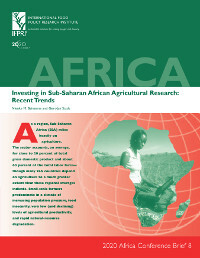 In 2000, R&D spending in SSA totaled nearly $1.5 billion (in 1993 international dollars), but funding has become increasingly scarce, irregular, and donor-dependent.These circumstances are often accompanied by poor national science and technology (S&T) policies and inefficient and ineffective agricultural research management. Institutional reforms and sound S&T policies are needed to improve the efficiency and effectiveness of agricultural research in Africa. Donorsupported projects have helped to build capacity in many countries, but these advances will quickly be eroded with the withdrawal of donor funding if other sources are not consolidated and further developed.While there is no universally recognized standard for the optimal size of agricultural R&D investments in Africa, a recent report of the InterAcademy Council (IAC) recommends doubling Africa’s agricultural research intensity ratio (agricultural R&D investments as a percentage of agricultural GDP) to 1.5 by 2015. In view of the low, and often declining, level of agricultural R&D investments in SSA, both in real terms and as a ratio of agricultural output, attaining this goal will be extremely challenging.